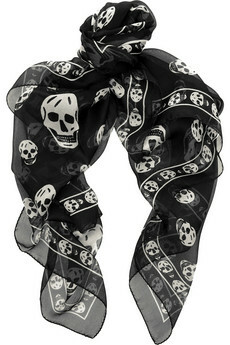 This Alexander McQueen skull print scarf has been in my mind for a couple years now.. It's sort of a dilemma, should I or shouldn't I? The minute I first saw it way back it crossed my mind, but I never really wear scarfs so I rejected the thought. But then, when Lee McQueen died I thought I should get it as a sort of token of my appreciation for him (The day he died I felt so horrible, the strangest thing - it's not like I knew him or anything of the sort, I just couldn't find myself to go on with my day and I left school before my first class even started.) Anyway, I never bought it. I never do really wear scarfs.. But the thing is, I don't have any that I love enough to wear, or think about wearing.. so maybe if I got this one, one that has a sentimental (sort of) value, and is simple yet full of character, maybe I would wear it? Posted by Katia at 8:46 p.m. I'm for the: "You should!" August 29, 2012 at 11:44 a.m.
Just get it, don't think too much, you don't have to wear it everyday! the skulls are so trendy anyway! P.S: I have a new post! and thanks for your sweet comment! August 30, 2012 at 12:57 a.m.
August 30, 2012 at 9:20 a.m. I adore scarfs. In fact, I have a collection. That´s why I say: You should. August 30, 2012 at 5:09 p.m. If you like come to follow me! August 31, 2012 at 1:25 a.m.
Buy it, its trendy and it matched almost with everything. I saw a similar one few days ago at Zara, also in white. August 31, 2012 at 6:01 a.m.
September 4, 2012 at 7:39 a.m. I have a brand new burgundy/black one, 100% authentic obviously, would you be interested? I got it as a gift and already have 3 so I'm thinking of selling this one. October 25, 2012 at 11:46 p.m.